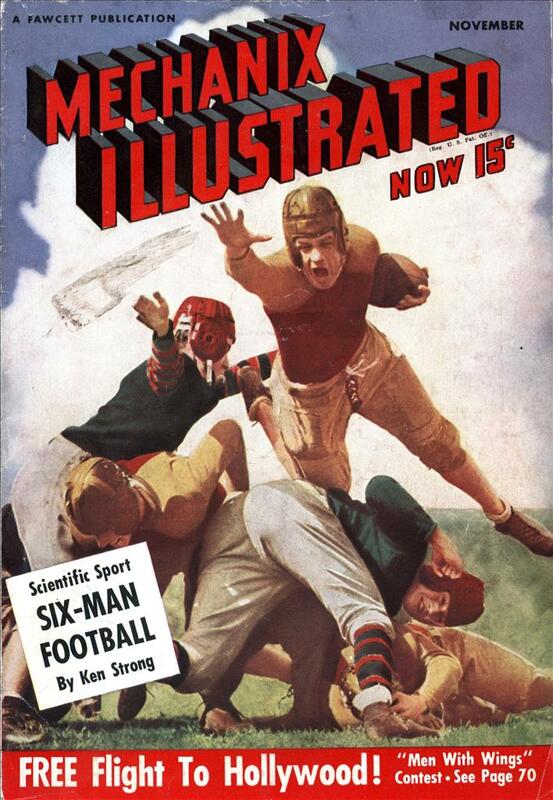 MECHANICAL perfection in play execution, with added thrills in spectacular open-style running formations, safety and economy are the themes of America’s newest sports craze—-six-man, or stream-lined football. And every gain the game makes up the side-lines of the nation’s popularity is deserved. The main idea in sports is to develop the players and to thrill the spectators. Six-man football will do both in a manner to supplement its big brother, the full-sized game, but it will do more; it will bring a new universality to football. It will develop thousands of new players and it will bring their money’s worth to millions of on-lookers who otherwise, conceivably, could never enjoy it. But first I must explain what six-man football is. The teams consist of two ends, a center, a halfback, a quarterback and a fullback. This tends to eliminate heavy linesmen and bone-crushing, power-plays. Of recent years there has been a tendency in collegiate football to commercialize the sport. Consequently, the smaller schools have had to take a back seat. The “gate” has become the all-important thing, instead of the original, primary purpose of the contest: to develop the players and provide clean sport. Then, too, an emphasis has been placed on strength and endurance in the big game. Here in the six-man contest strength will not be important. But brain-work and well planned strategy are paramount. Since there are fewer men on the field, every play will be more individual. A single man will block a defensive player, where in regulation football two, and sometimes three men are used. Thus we find that players will be developed both physically and mentally. And not just a score of highly trained specialists, either, but the whole male enrollment of the school can benefit by the competitive spirit. Boys who attend an institution where money is not available for equipping a full team, or buying impressive stadia, now may know the thrills of carrying the ball on a long run, or catching the winning pass. And they can know another excitement, too: that of making a dramatic play before the home town folks. From my own gridiron history a story can be brought out which will perfectly illustrate a pertinent point. At West Haven, Connecticut, High School, when I was there, we had seventeen or maybe eighteen men on the football squad. Consequently, we had to bring in towns-folk in order to scrimmage. We could have had a well-rounded six-man football team, able to practice plays to perfection. Joseph P. Doakes, out in Four Corners, Iowa, an 120-pound boy with plenty of courage, might never be an All-American. But he now can gain athletic fitness, leadership, self-confidence and co-ordination on the football field, through this new game. Now let us go with Joe down to the gridiron behind the school, and I’ll tell you where his game, the only one his small school can afford because of lack of man-power and finances, differs from its parent. First thing, of course, you will notice that the field is only eighty yards long and forty yards wide, with the markings five yards apart. Then you will examine the goal posts, which are wider and have lower cross bars This makes field goals easier. Joe’s teammates, who will not necessarily be husky fellows, will be kicking the ball around, with rubber shoes. When scrimmage starts, the teams line up in a manner unique to followers of the orthodox game. The defensive team puts the ball into play by kicking it off from a line twenty yards in front of the goal they are defending. The Sixes who are receiving may line up anyway, just so none of them are less than ten yards from the ball at the kick-off. The lineup on both sides looks pretty thin at this point, which makes you understand why the field has been narrowed. As it is, each player has more space to play in than a man in the full-sized game. There are 267 square yards for each man i n stream-lined football, to 242 square yards per man in the big game. Here is the kick. The receiver is dropped in his tracks and you note that this is no sissy’s game, that there are plenty of man-sized tackles. Now both teams line up, with three men on each side of the line. 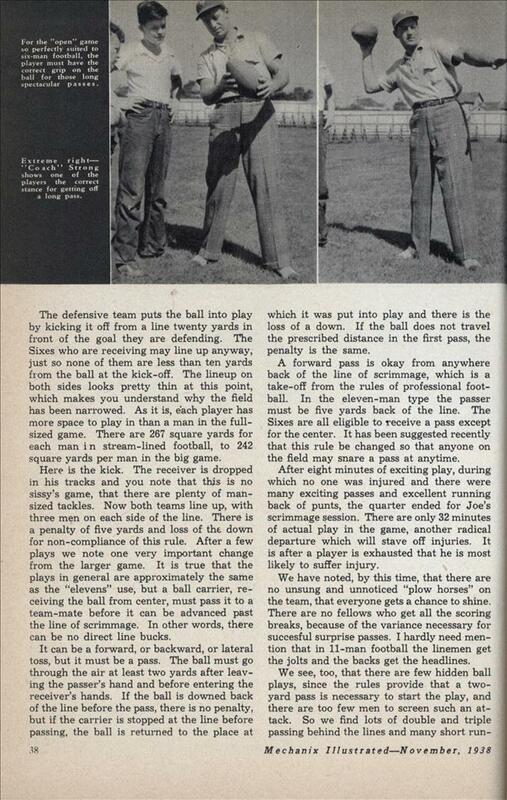 There is a penalty of five yards and loss of the down for non-compliance of this rule. After a few plays we note one very important change from the larger game. It is true that the plays in general are approximately the same as the “elevens” use, but a ball carrier, receiving the ball from center, must pass it to a team-mate before it can be advanced past the line of scrimmage. In other words, there can be no direct line bucks. It can be a forward, or backward, or lateral toss, but it must be a pass. The ball must go through the air at least two yards after leaving the passer’s hand and before entering the receiver’s hands. If the ball is downed back of the line before the pass, there is no penalty, but if the carrier is stopped at the line before passing, the ball is returned to the place at which it was put into play and there is the loss of a down. If the ball does not travel the prescribed distance in the first pass, the penalty is the same. A forward pass is okay from anywhere back of the line of scrimmage, which is a take-off from the rules of professional football. In the eleven-man type the passer must be five yards back of the line. The Sixes are all eligible to receive a pass except for the center. It has been suggested recently that this rule be changed so that anyone on the field may snare a pass at anytime. After eight minutes of exciting play, during which no one was injured and there were many exciting passes and excellent running back of punts, the quarter ended for Joe’s scrimmage session. There are only 32 minutes of actual play in the game, another radical departure which will stave off injuries. It is after a player is exhausted that he is most likely to suffer injury. We have noted, by this time, that there are no unsung and unnoticed “plow horses” on the team, that everyone gets a chance to shine. There are no fellows who get all the scoring breaks, because of the variance necessary for succesful surprise passes. I hardly need mention that in 11-man football the linemen get the jolts and the backs get the headlines. We see, too, that there are few hidden ball plays, since the rules provide that a two-yard pass is necessary to start the play, and there are too few men to screen such an attack. So we find lots of double and triple passing behind the lines and many short run- ning passes to the ends. Then there are hair-raisers galore, such as starting the play with a backfield lateral pass and a sweeping run to the right, with the left end blocking and then dashing to the extreme left of the field to catch a field-wide lateral while free of any opponent. After such an observation we become convinced that zone defense against passes will not be effective, that a man-to-man defense: such as is employed in basketball, is necessary. Because of the size of the field, punting must be very accurate and can be made a powerful weapon; the team with an accurate kicker has an important advantage. The kicker has more time, because there are fewer men to rush him. When his team is backed up against its own goal line he can always place the ball so far down the 80-yard field that he snatches the advantage away from his opponent. I have heard a bit of skepticism from other football devotees over punting with sneakers, or basketball shoes. But I have absolute proof that these rubber brogans may be used to good advantage on the football field. In December, 1934, when I was playing halfback with the New York (Football) Giants in the game with the Chicago Bears for the professional football title, we were behind 13 to 3 at the half. But we changed to sneakers because the ground was frozen and cleats were of no benefit, and I punted, kicked off, made points after touchdown, all in rubber shoes. We won 30 to 13. I have always credited those sneakers with the victory. Now I have pointed out just where the Sixers’ game differs from the regulation one. Remember that the fundamentals are the same, that blocking and tackling, passing and punting must of necessity be learned and perfected, the same as in the larger game. But the basic activities must be learned better than in the big brother contests. Tackling, for instance, must be cleaner. More of them will be in the open, and cases where a carrier is stopped by general congestion in the line of scrimmage will be extremely rare. On page 39 you will notice three play formations, which are simple enough and will suggest many other possible attacks to any boy with a quarterback complex. After a few wide-open plays function perfectly in the field you and your “Sixer” teammates will probably sing the praises of Stephen Epler, the Nebraskan who thought the game up and promoted it, in 1934. And so I give you the “Sixer” game and I know you will like it. Perhaps, in time, colleges will promote such contests to give a chance for fast track stars and basketball luminaries to participate—and still not seriously risk their valuable legs. What a thrill such a game would be! It took a mere 27 years to develop this into 43-Man Squamish. This is news? We played 3, 4, 5, 6, or however many kids were available football when I was younger. Does not take a rocket scientist to figure out how to make it work with less people. Robert: Since it was printed in 1938, by definition we can’t actually call it news. @John, I was referring to 1938, considering the rules were basically set up for 11 men in 1880 by Walter Camp, kids had to have been playing with various numbers of players even then. Seems to me they were overstating the obvious in this article.